We all like Android devices because they are using an open source operating system. This kind of system allows you to make your own options the way you like. We all love to change our ringtones or sounds and Android offers very much options to choose from. You can personalize default ringtones, alarm tone or any small notification tones. Android Play Store is a almost a classic way to find the ringtones that you want to hear every day. You will simply need to access it and you certainly find more options that you have ever seen. You can filter your results by introducing a key word. This will let you to find exactly what you need and find it quickly. After you find them, you will need to save them and personalize your device. You can change your ringtone easily if you have an Android Smartphone by accessing Menu, Settings And then Sound. Here, you will find phone ringtones and notification ringtones. they can be easily played by tapping them. After that, you will tap OK and your settings are saved. The alarm tone can be easily changed too by accessing your clock which will redirect you to the Alarm. After that, you will simply tap on the Alarm and you will modify the alarm tone the same way you’ve done it for ringtones. Message notification can be changed into the menu of messages. You will tap on settings and access notifications and select ringtone. Tap on them and modify the way you like. If you want to set a song that you play as a ringtone, you will simply need to tap on its menu and select “Set as”. 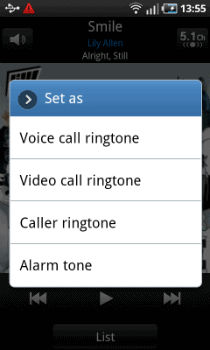 You can set it as alarm tone, caller ringtone or phone ringtone. If you want it to be a ringtone for one of your contacts, you will tap on “caller ringtone” and select one from your contacts. Next time when that contact will call you, the ringtone chosen will play. Android accepts you to do anything and you will certainly have a good experience using it.